It’s safe to say that the 2016 Jeep Wrangler isn’t only one of the most versatile SUVs on the road, but also one of the most versatile vehicles in the industry. After all, the nameplate offers everything a driver could possibly want from their new ride: award-winning power, technology, cargo room, and an array of exterior amenities. As a result, the Wrangler could reasonably be considered an off-roader, a daily commuter, or even a special-occasion vehicle. To really understand what the 2016 Jeep Wrangler has to offer, why not explore the nameplate a bit further? The 2016 Wrangler is one of the only Jeep vehicles that has been branded with the ‘Trail Rated’ badge, thus confirming the nameplate’s off-roading prowess. This accolade isn’t hyperbole. Rather, the brand only awards this honor to vehicles that prove to be capable on and off the beaten path. The Wrangler’s powerful engines provide enough muscle to overcome any obstacle, and the excellent fuel efficiency means drivers can actually enjoy the ride’s capabilities (as opposed to making constant stops at the gas station). Meanwhile, the accompanying mechanics help provide the driver with a safe and optimal driving experience. Customers won’t be overwhelmed by multiple engine offerings. 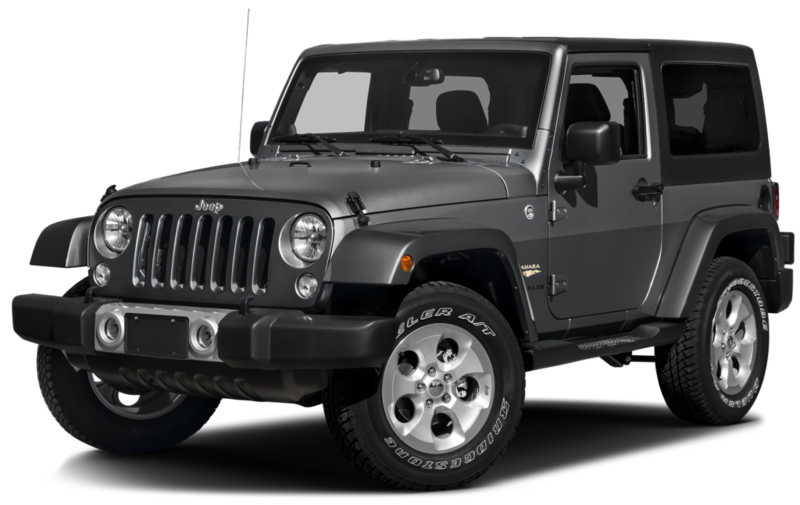 Instead, the Jeep Wrangler is equipped with a single capable unit: the 3.6-liter Pentastar V6 engine. The system delivers some incredible power, including a best-in-class 285 horsepower and 260 pounds-feet of torque. Plus, thanks to technologies like the six-speed manual transmission, drivers should expect a 17 city/21 highway mile per gallon fuel efficiency. Those power specs end up contributing to the Wrangler’s 3,500-pound towing capacity. Thanks to the inclusion of the Trailer Sway Control technology, drivers will also be assured that their hauled cargo won’t be swerving all over the road. A powerful and efficient engine is all well and good, but you surely couldn’t expect your SUV to perform like an off-roading behemoth without the proper accompanying mechanics. Fortunately, the Jeep Wrangler offers all of these amenities, resulting in an ideal driving experience. For starters, drivers can choose to equip their Wrangler with either the Command-Trac NV241 4×4 system, a system that plays an important role in the nameplate’s best-in-class winter performance. Meanwhile, the Rock-Trac 4×4 system results in some best-in-class off-roading performance, meaning drivers should be able to crawl over any off-roading obstacle. The Wrangler offers several additional innovative mechanical features, including the Dana 44 heavy-duty axle (improves ground clearance) and the Tru-Lok locking differential (contributes to the vehicle’s excellent traction). Finally, the sway bar disconnect system allows you to better adapt your Wrangler (when traveling at low speeds) to the road conditions. Drivers will be spending the majority of their time sitting inside their new SUV. Therefore, it’s important that the interior offers all of the features and the amenities that a driver could possibly want. The luxurious features will allow drivers to travel in style, while the incredible amount of cargo room assures that you’ll never struggle to fit all your luggage. Plus, the Wrangler also offers an abundance of technological features, meaning occupants will constantly be entertained. Sure, the McKinley Black leather seats may demand a Wrangler owner’s attention, but these drivers will soon learn to appreciate the vehicle’s other interior amenities. For example, the leather-trimmed steering wheel adds some opulence to the interior, while the heated front seats will allow occupants to escape from the winter cold. It shouldn’t be much of a surprise, but the Wrangler also offers drivers a whole lot of cargo room. The SUV provides 12.8-cubic-feet behind the second row, but this can be expanded to a maximum 56.5-cubic-feet of space when the rear fold-and-tumble seats are hidden. For additional storage place, drivers can utilize the storage bin hidden under the rear cargo area, as well as the lockable center console (the perfect place to hide your most valuable cargo). Best of all, the interior can be easily washed and cleaned. The interior drain plugs will automatically ditch any water inside your ride. That way, when you’re looking to clear the dirt following an off-roading excursion, you won’t have any apprehensions about taking a hose to your interior. Jeep has done a commendable job of upgrading their technology over the past few years, and these efforts have truly culminated in the 2016 Jeep Wrangler. That’s evident by the variety of radio units available via the nameplate, including the advanced Radio 430N system. The 6.5-inch touchscreen provides drivers with access to a navigation service, SiriusXM Satellite Radio, and phone connectivity. If drivers wish to enjoy their preferred tunes, they can do so via the Wrangler’s best-in-class audio system. The Alpine premium all-weather sound system provides four 6.5-inch speakers, a pair of weather-resistant ‘tweeters,’ and a powerful, all-weather subwoofer. If drivers are seeking even more technology, they won’t have to look any further than their dashboard. After all, the Wrangler also includes a premium instrument cluster. This technology will provide the driver with a wealth of information, including speed, fuel efficiency, and vehicle diagnostics. While the driver may not necessarily be able to appreciate their Wrangler’s exterior, there’s still no denying the fact: drivers want their new ride to impress others. Fortunately, the Wrangler’s versatile and amenity-filled exterior will more than do the trick. The Jeep Wrangler’s incredible performance makes it a natural choice for winter drivers. However, the nameplate can easily be adapted to provide a whole bunch of summer amenities. The exterior offers a whole lot of additional amenities that will cater to the driver. It starts with the multiple wheel options, including the striking 18-inch seven-spoke polished aluminum wheels. Jeep even provides a full-size spare tire, so you won’t have to panic if one of your tires suddenly fails. The revamped turn lamps, headlamps, and fog lamps will help improve visibility, an appreciated feature on those dark and stormy nights. The available side steps will allow passengers to easily enter and exit the Wrangler, while the heated power mirrors will remove any ice or snow (thus providing a better view). If you’re going to be opting for a new Wrangler, there’s no better place to make that purchase than The Faricy Boys in Colorado Springs, Colorado. The dealership offers a variety of new and used vehicles, so customers will certainly be able to find a ride that fits their desires. Best of all, the helpful financing department will help the customer settle any monetary issues, while the service department will help repair any Wrangler-centric issues. As a result, your relationship with The Faricy Boys won’t end after you’ve made that purchase. Of course, to truly understand what both the Wrangler and the dealership has to offer, a customer has to step into the actual business. So, what are you waiting for?